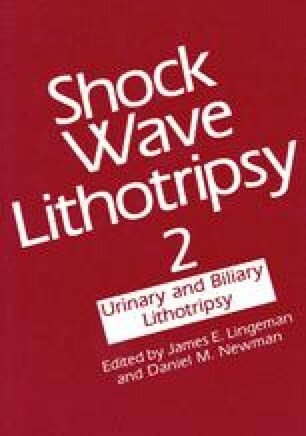 Transmission of Shock Waves Through Bone: Is it Possible to Treat Iliac Ureteral Stones with Patient in the Supine Position? In order to evaluate the effects of shock waves passing through bone and to evaluate the amount of energy attenuation and its dependence on bone thickness and composition, the pelvic bones and femurs of two pigs were exposed to shock waves. These bones were brought into the acoustic field in an experimental Dornier lithotripter (XL1). Measurements were made at seven different sites and at various generator voltages (14 kV, 17 kV, 20 kV, and 23 kV). For registration of the pressure amplitude transmitted, a polyvinyl difluoride (PVDF) membrane hydrophone probe was used. Electrodes for measurement had generated at least 150 shock waves. A significant correlation between the pressure transmitted and the whole bone thickness (r = 0.87) was found, and this correlation can be described with an exponential equation. The energy attenuation primarily is influenced by the amount of cancellous bone (r = 0.74). The shock wave profile is not changed significantly with a bone thickness of less than 1 cm. The spatial relationship of the iliac ureter to the posterior body wall, the anterior body wall, and the iliac bone thickness was measured on 32 computed tomography (CT) scans of the greater pelvis at three levels. The mean distance between the iliac ureter and the posterior body wall at an angle of 35 degrees was 15.2 cm; whereas, the distance to the anterior abdominal wall was 10.5 cm on the average. The working distance of 13 cm in a Dornier HM3 lithotripter will be exceeded in about 90% of patients in the supine position and in 10% of patients in the prone position. The average thickness of pelvic bone was 1 cm to 2 cm. An increase in generator voltage from 14 kV to 23 kV at a bone thickness of 1 cm to 2 cm will not compensate for the loss of energy.